Recently, concept renders of a futuristic looking phone dubbed “Nokia X” emerged online. Rumours of the Nokia 10 have been floating around ever since HMD Global acquired the licensing rights over the Nokia brand name. Now, an ithome report hints the commercial launch date of Nokia X has been revealed. 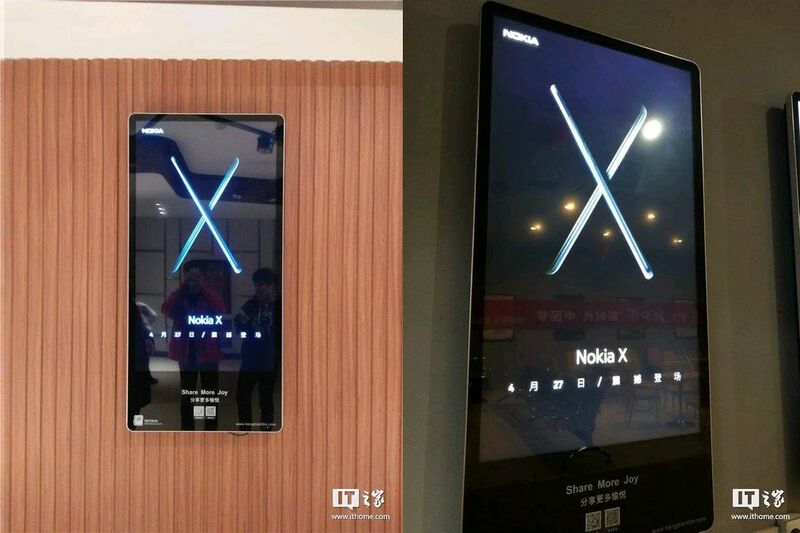 A person posted images of a Nokia X advertisement found in a multiplex in China. HMD Global seems not only has confirmed the existence of smartphone, but it also revealed that it is planning to release the phone this month itself on April 27. The electronic billboard shows silhouettes of two phones crossed against each other to form an X along with the launch date mentioned below. There is no other detailed information about the device shared by the company. Nevertheless, it comes as a big surprise since the launch date is almost upon us, and no one seems to have heard about the phone. HMD Global is tight-lipped about their upcoming device. From the photos, however, we can decipher that Nokia X will come sporting a 2.5D curved glass display and a metallic back. The metal body is also curved on the corners. The alleged renders of Nokia X that were spotted a week earlier might shed some light on the key features and specifications of the phone. From the looks of the renders, the device seems to be a flagship-grade phone with a screen notch on the top left corner. This notch itself contains the selfie camera and a couple of other sensors. On the rear, the phone appears to be sporting a dual camera system. The sensors are aligned horizontally at the top left corner with LED flash separating the sensors. There is also Zeiss logo on top right corner hinting the phone may employ Carl Zeiss optics. There is also a fingerprint scanner located in the centre of the rear panel while a Nokia logo can also be seen. The device packs a 3.5mm audio jack and a USB Type-C port. The renders showed the smartphone in a number colour options including white, black, gold and silver. Of course, these are mere renders imagined by someone and don’t confirm anything so far. We don’t have any information about the hardware of the smartphone too.